Well it's officially fall.... There is a cool nip in the air & the leaves are starting to fall from the trees (well at least they are at my house). You will be happy to know that I took all of your advise at giveaway time and put up most of my Halloween decor (that night :) & I ♥ it! So I thought I would show you a few pics to at least prove that I do a little more then just canning! The Pumpkin I got at our Church's Free Market this year. Even my Desktop has a little Halloween spirit! Well I better start planning a birthday party for my Corbin. His b-day is on the 6th but we are going to party it up on Sunday! Then we have Addison's Birthday on Halloween. It's going to be a fun filled October. 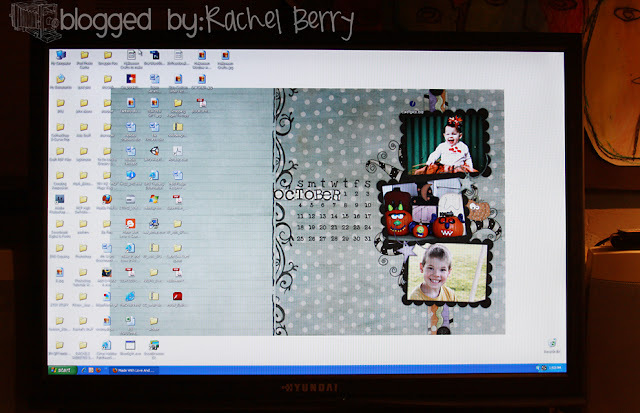 You can get the Free October Desktop that I have on my computer by clicking here! I love all of your decorations. I have had my house decorated for a few weeks now but thats because I don't have many decorations. I need to get more. OMGOSH... SO STINKEN CUTE! this stuff is all right up my alley! I love the pumpkins on the black candle sticks, the cute country basket. That cute ghost with his mouth open real long... OH' all of your stuff is so cute. I adore the skulls in the jar. GREAT JOB RACHEL! P.S. my sons b-day is Oct. 12th he will be 8, and then he gets baptized on the 31ST. FYI!!! it will be a busy month for me for sure! 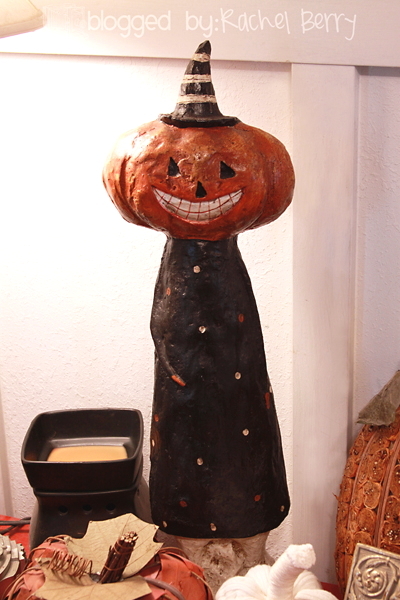 did I SAY CANDLE STICKS.. good thing I took another look DUH' k- the cute pumpkins in the black urns... LOVE IT! I can't believe the pumpkin you got for free! It's a beauty! Love all your decor. That ghoulish ghost gourd is cracking me up! Love your Halloween decor. Did you make the tan pumpkin with the brown bow? It's so me! I wore my fall flowers the other day and got a ton of compliments ~ thank you! Darling Halloween vignettes goin' on over here so far. I have the same Mr. pumpkin bobble head...gotta love Safeway! I love your decor! I need to get in the decorating spirit. . but just too tired lately. Must be my stinkin thyroid gland. I have to get that in order. Thanks for sharing. BTW - do you have to can all of that cider or does it keep in the jugs? How on earth do you store it all? The bobble heads are a HOOT! LOVE the pumpkins with rick rack. Adorable decor. Way to go! Your decorations are great! Love the bobbleheads. Cute stuff. Love your little stuffed pumpkin. And the ones with rick rack. Wish we had a Safeway here. Oh wait! NO MORE Halloween for Mimi! I mean it this time. 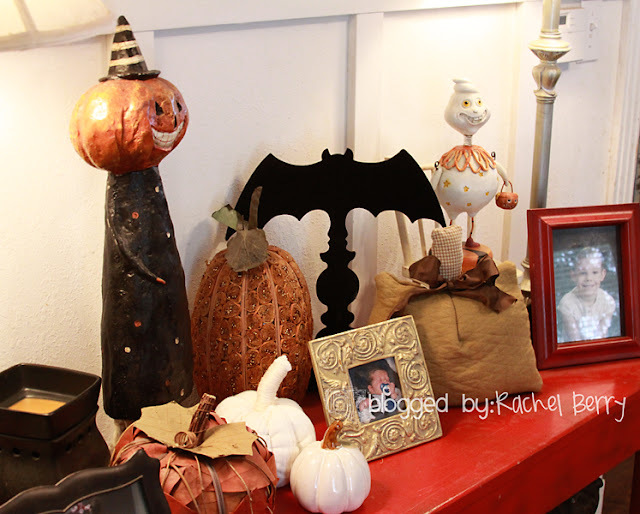 Love all the cute goodies goin' on... Super Halloween FUN! If I didn't ADORE you, I think I might hate you. but seriously, your decorations are So.incredibly. awesome. Happy Fall! I love your Halloween decor. I really need to get more...I love the way you filled your apothecary jars! Will you like totally come and decorate my haunted house? 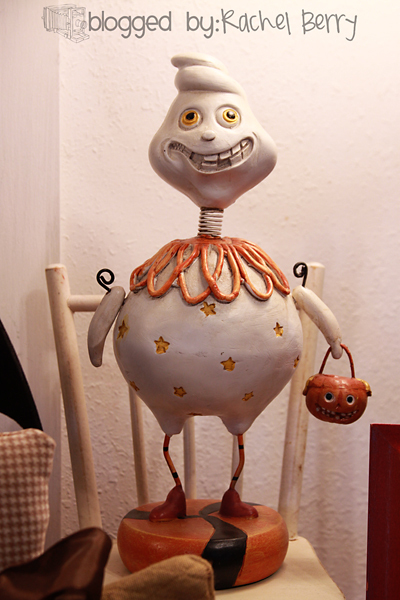 I love the standing bat, and the pumpkins in the urn, did you paint the pumpkins white? 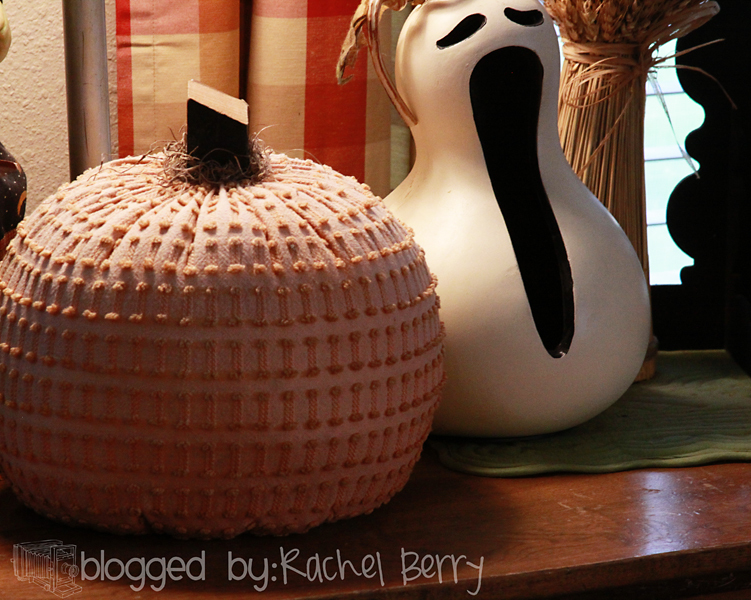 I LOVE it all... especially the chenille "pumpys" (as my nephew calls them!!) You need to come over to help me every season, okay?? And go ahead and bring some cider, I'll make the cookies! I was in your neck of the woods for a volleyball tournament this weekend...Medford! We had snow on the way home!! My daughter and I LOVED the tax- free shopping! Such cuteness!! Love all the spooky-full goodness!! You have inspired me to get into the decorating spirit. However, it is snowing right now so I feel like I should put up the Christmas decorations. Is it too early to decorate for Christmas? Ok ok ok I guess I wont wait till the last week in october to get out the decor this year. I really like your decor! The 3 from Safeway are absolutely darling!!! Oh, can I tell you how in love with all your Halloween stuff I am???? 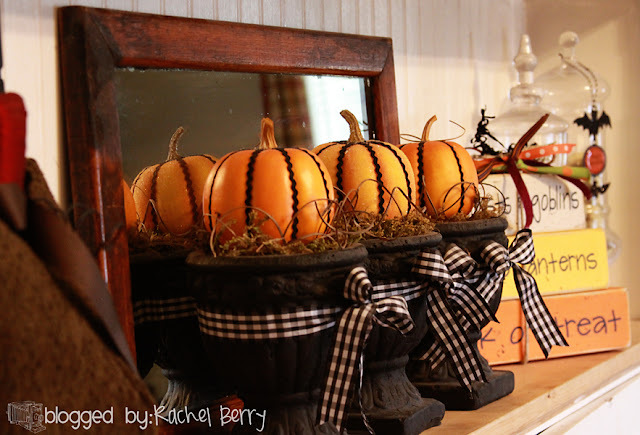 I love the vintage stuff.. and that mirror with the pumpkins in the urns... oh be still my heart :-)!! Have fun at your scrapbook retreat!!! I love all of your stuff! I posted my decorations (they do not compare to yours). So super cute!! Wow I love your style!! 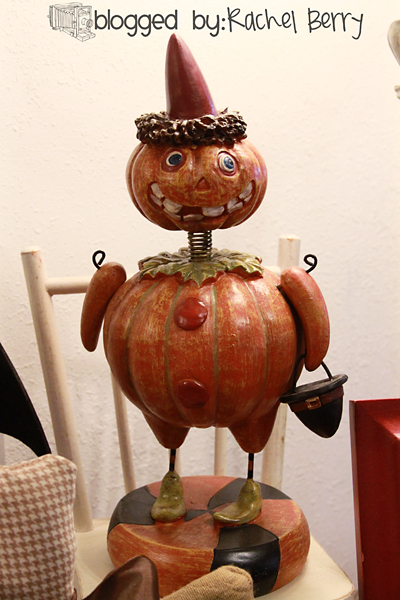 And I love fall decorations, so fun to see! I'm a new follower love your stuff!